ROYAL CHRISTMAS CARD SIGNED BY THREE PRINCES, INCLUDING TWO FUTURE BRITISH KINGS. A Christmas card illustrated with a street scene signed by three sons of King George V: the princes EDWARD (1894-1972; future King Edward VIII, at age 13), ALBERT (1895-1952, future King Edward VIII, at age 12) and HENRY (1900-1974, future Duke of Gloucester and Governor-General of Australia, at age 7). 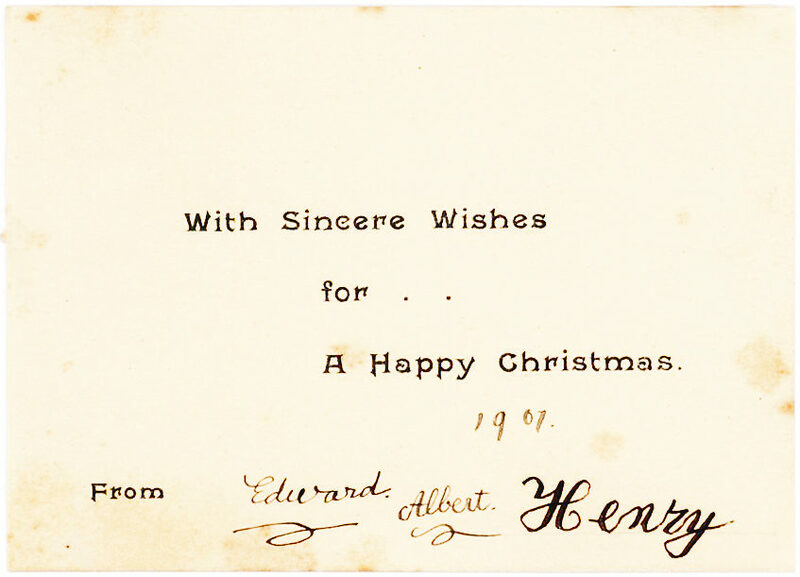 (“Edward,” “Albert,” and “Henry”). 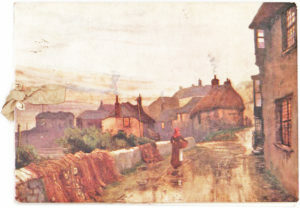 1p. Oblong 16mo. 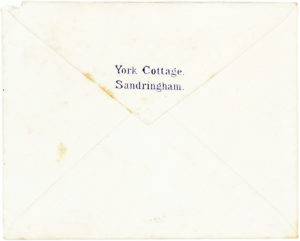 Sandringham, (December 21), 1907. 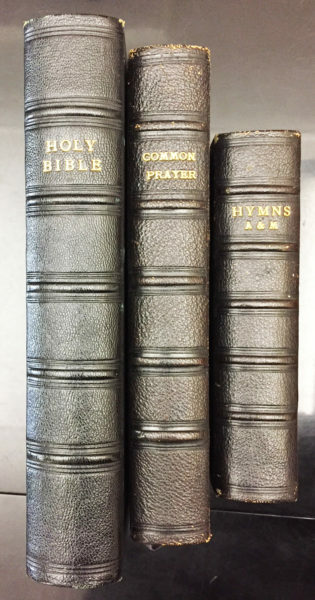 The message printed on the paper insert (detached from the binding, but present) reads “With sincere wishes for a happy Christmas from” underneath which the three princes have signed their names. 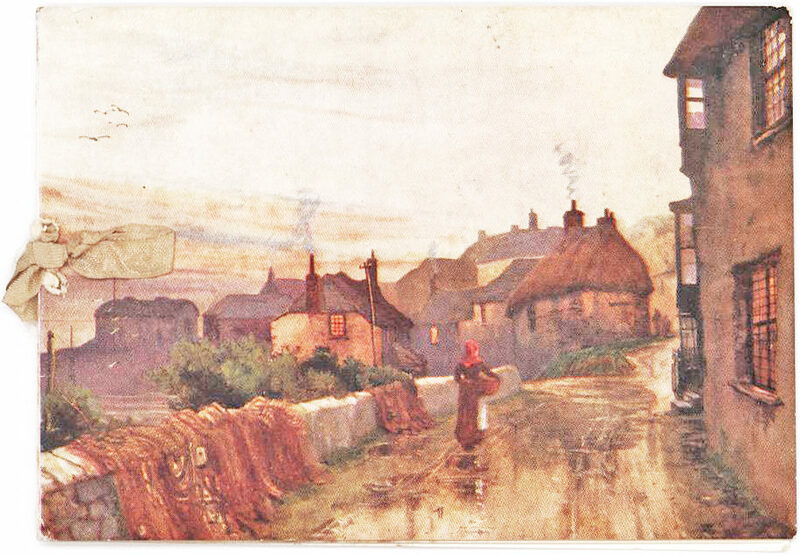 The stamped envelope is addressed to the Italian-born, British artist EDOARDO DE MARTINO (1838-1912), known for his maritime scenes. 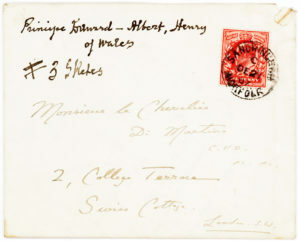 At the time our card was signed Queen Victoria’s eldest son, Edward VII, had succeeded her to the throne. Our card was signed by three of his grandchildren, sons of the future King George V, who would succeed his own father in 1910. Upon George V’s death in 1936, Edward, Prince of Wales, became Edward VIII, the controversial monarch who abdicated the throne to marry American divorcee Wallis Warfield Simpson. Edward and his wife were made Duke and Duchess of Windsor but lived the rest of their lives in the Bahamas and France. It was not until the late 1960s that the royal family officially accepted Simpson and invited them to England. Edward’s reign is the second shortest in the history of the British monarchy and he is the only British monarch to have abdicated voluntarily. 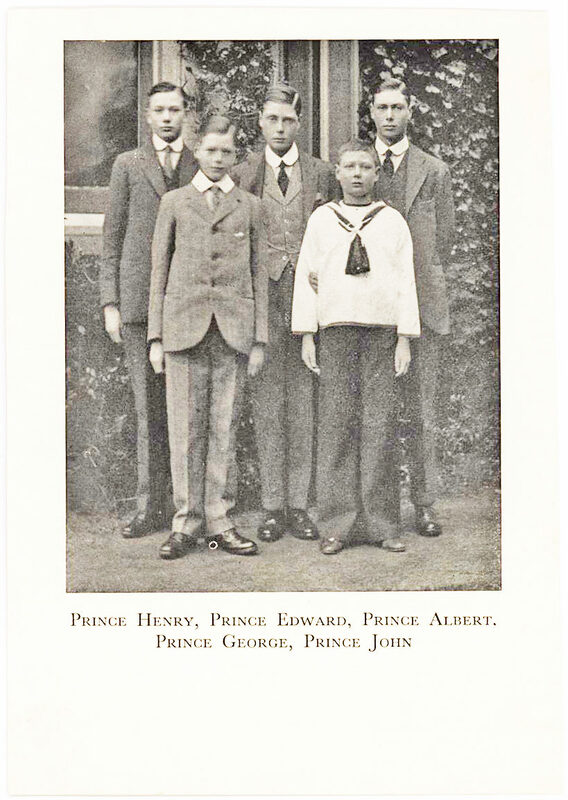 Edward VIII was succeeded by his brother, Albert Frederick Arthur George, known as “Bertie.” Born third in line to the throne, he developed a reserved personality, troublesome speech impediment and a deep spirituality. “After the abdication crisis of 1936, [George] replaced his flashy elder brother Edward VIII and determined to re-establish the monarchy as the paradigm of decorum, reliability and reassuring staidness that it had been during his father’s reign,” (“George V: The Unexpected King and George VI: The Dutiful King,” The Guardian, Davenport-Hines). The third son of five, Prince Henry pursued a military career, joining the Army rather than the Navy as was expected. 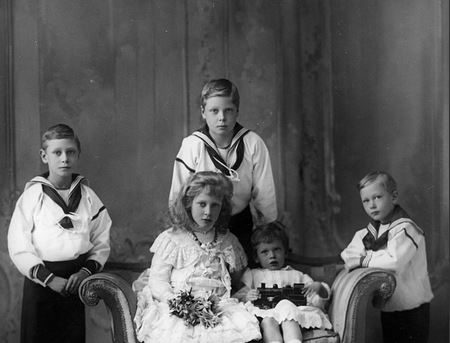 After Edward’s abdication, Henry was fourth in the line of succession, after his brother George VI and his nieces Elizabeth and Margaret, putting the brakes on his military aspirations. He served a diplomatic role during World War II, after which he became the only member of the royal family ever to serve as Governor-General of Australia. 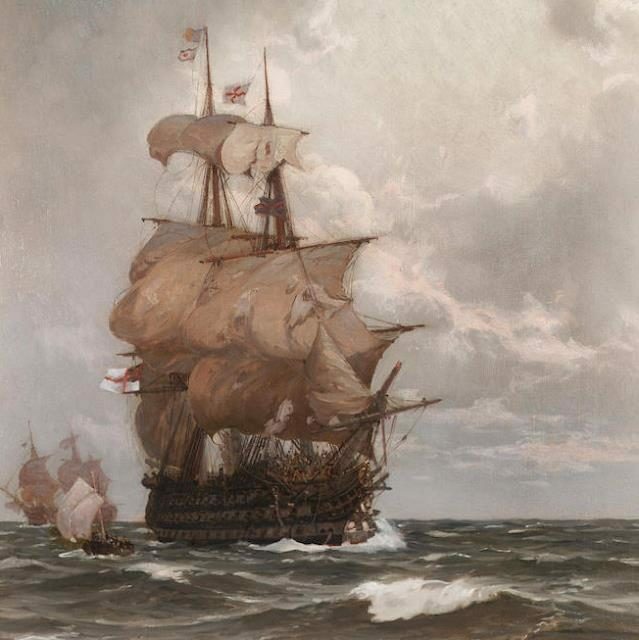 A former officer in the Italian navy, de Martino was renowned for his paintings of British naval victories. 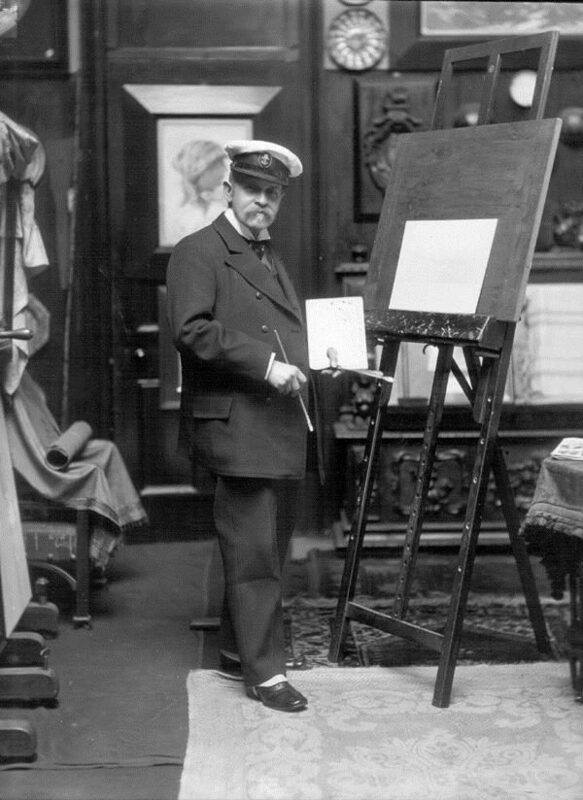 The esteem in which he was held at court was such that, in 1901, he accompanied the Duke and Duchess of Cornwall and York, later King George V and Queen Mary, on their eight-month-long tour of the empire, making a number of sketches of the places they visited. 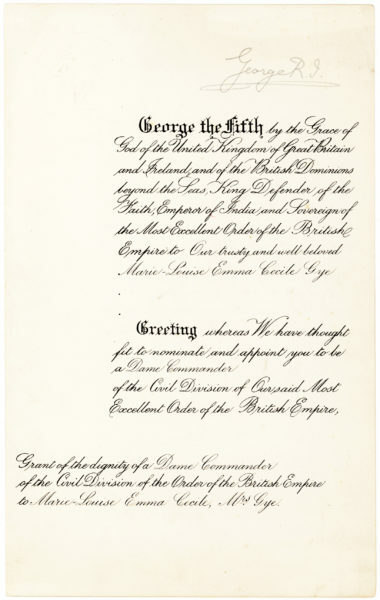 The following year, King Edward VII appointed him Honorary Commander of the Royal Victorian Order (C.V.O.). 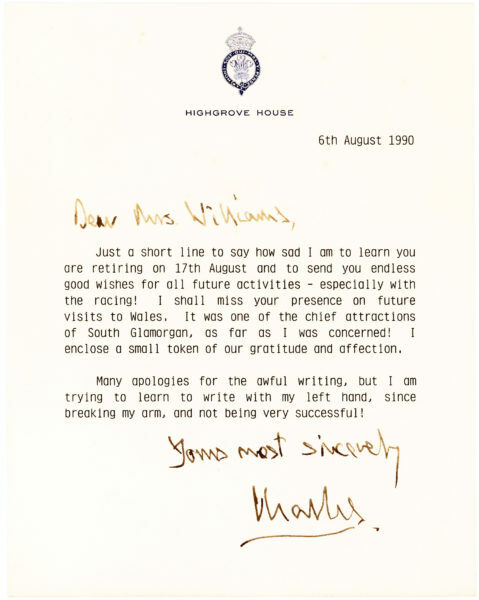 Some scattered foxing to the folded inner sheet with the printed and signed greeting, but in very good condition. With the original envelope addressed in an unidentified hand to “Monsieur le Chevalier / De Martino / C.V.O. 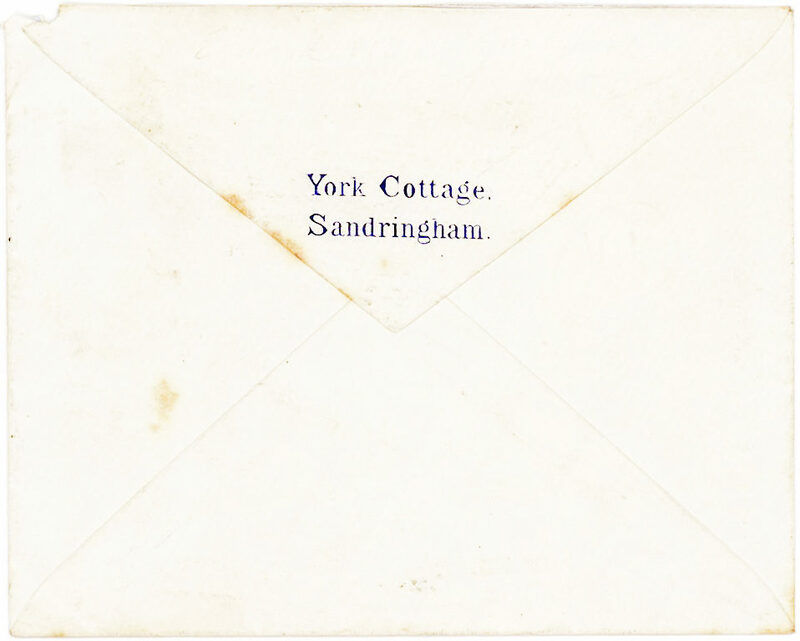 / 2 College Terrace / Swiss Cottage / London S.W.,” and the printed return address of York Cottage, Sandringham, plus a black-and-white printed photograph of the princes along with younger brothers, princes George and John.